My Private Jet | gingerbread smiles. Before jetting off to Florence I had to create my holiday manicure. Usually I like to have something bright or some nail art to catch people's eyes but for this holiday I wanted something more classic. I chose OPI - My Private Jet. This is a colour I've had for about a year now and haven't worn much. 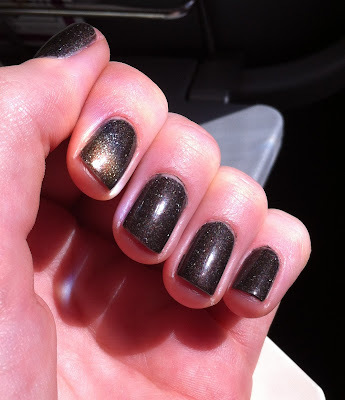 It's a beautiful black/dark brown polish with lots of specs of holographic glitter throughout. It's a bit like having simple galaxy nails without the effort. I believe My Private Jet is one of OPI's base range so where ever there is a full OPI rack (Debenhams/Fenwick) this should be there.